Earth Friendly Products Toilet Cleaner is Viscous formula, comprised of cedar oil (for effective cleaning and deodorizing) and citric acid (to safely and effectively remove difficult rust and other stains), for use on toilets, urinals and other ceramic bathroom surfaces, including sinks, shower walls, etc. 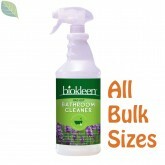 Removes hard water stains and mineral deposits and some rust without any toxic fumes. Earth Friendly Products Toilet Bowl Cleaner is Non-toxic, readily biodegradable, pH balanced & is made from renewable & sustainable, plant-based ingredients. 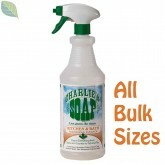 It's even free of synthetic perfumes and dyes & is greywater and septic safe. ECOS Toilet Cleaner is Recognized by the EPA's DfE and USDA's Biopreferred Program as Biodegradable & Environmentally Friendly. Water 7732-18-5, Citric Acid (plant-based pH adjuster) 77-92-9, Gluconic Acid (plant-based pH adjuster) 526-95-4, Phenoxyethanol (preservative) 122-99-6, Xanthan Gum (plant-based, food grade thickener) 11138-66-2, Cocamidopropyl Betaine (coconut-based surfactant) 61789-40-0, Juniperus Mexicana (Cedarwood) Oil 68990-83-0, Methylisothiazolinone (preservative) 2682-20-4.